Most restaurants in Normandy’s delightful Trouville, a small seaside hamlet characterized by a quiet charm, engage in the preparation of simple and fresh but hardly memorable seafood dishes. Not so at La Petite Auberge, where the small menu of carefully prepared, complex dishes denote noteworthy culinary ability. Though Trouville and Deauville are two of the prettiest towns of the French Riviera, they really couldn’t be anymore different. One thing they do have in common is many dining spots characterized by simply prepared, unpretentious dishes that only in rare instances hit noteworthy culinary highs. 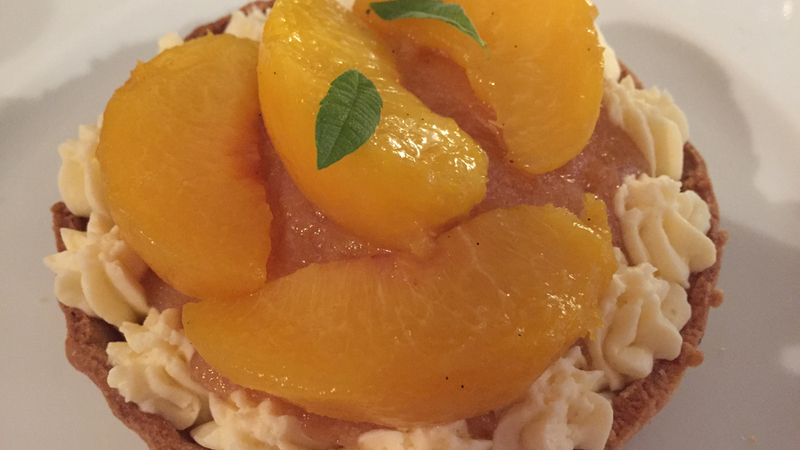 Not so at La Petite Auberge, where the small menu boasts fresh, carefully sourced ingredients and real ability in turning them into something worthwhile. The restaurant is actually quite small and simply adorned, but what it doesn’t have in flash and up to date style it makes up for with seaside country charm and intimacy. Chef Michel Gandois capably concentrates aromas and flavors while bringing each out into the open, so individual dishes speak not just of a harmonious whole, but of the single ingredients as well. 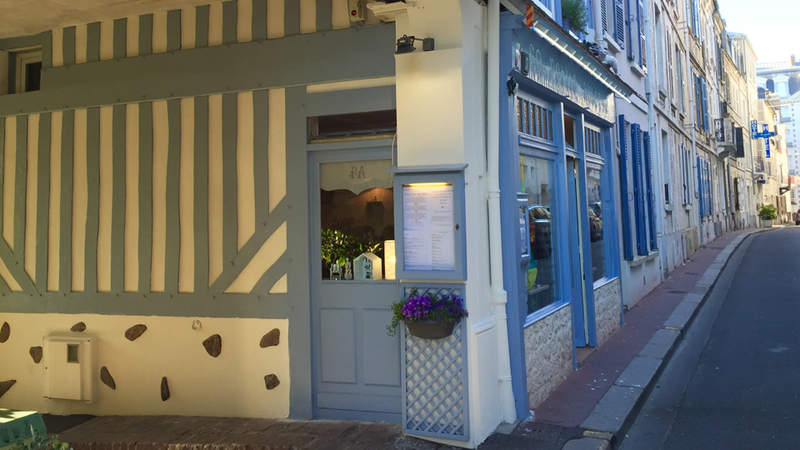 In ultimate analysis, La Petite Auberge is one of the top restaurants to dine in Trouville (and Deauville, for that matter). 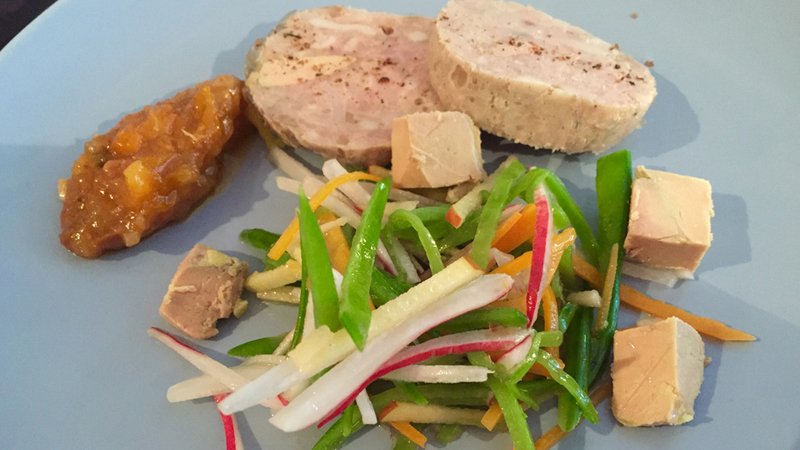 The rabbit and foie gras, sausage and fresh summer fruit chutney is a good example of what La Petite Auberge does so well. The rabbit paté is smooth but flavorful, and far removed from fatty and neutral examples that you’ll run into most everywhere in lesser quality French dining establishments. The fresh fruit chutney adds a welcome acid lift, its sweetness buffering the inherent bitterness of the foie gras very well. 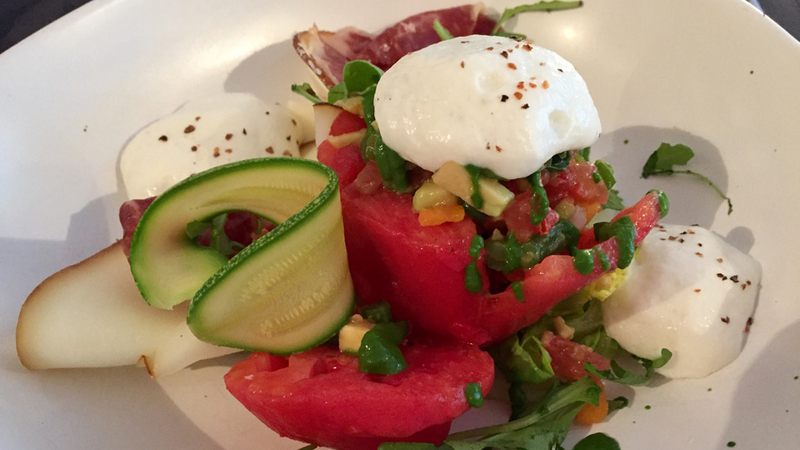 The tomato stuffed with a vegetable tartare, arugula pesto, and smoked mozzarella mousse is the perfect foil to a hot summer day, easygoing and refreshing but with sneakily concentrated, complex flavors that linger nicely. 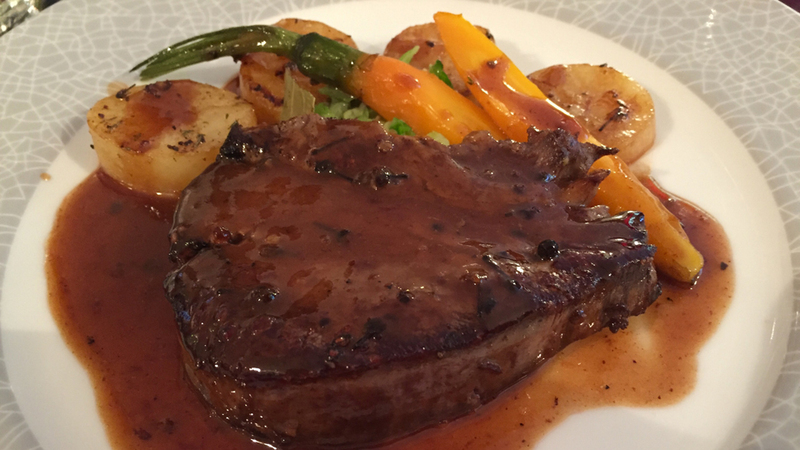 The beef with veal juice reduction and Voatsipérifery pepper is moist and soft, exuding intense flavors of hazelnut and woodsy underbrush. Once very hard to find outside of the Indian Ocean’s islands, Madagascar’s Voatsipérifery pepper (Piper borbonense) is now found increasingly on menus as chefs all over the world are discovering its highly aromatic nature, which is characterized by especially woodsy, citrus and floral notes, complicated by a hint of pine cone. An only moderately hot pepper, its ideal destination are seafood dishes, desserts and even chocolate; with meat dishes, it is often used blended with other spices but on this night it was fine on its own, adding another dimension to my specific meat dish. I ended my meal with a couple of desserts, the first of which highlighted a local specialty, cider (and hence, apples). 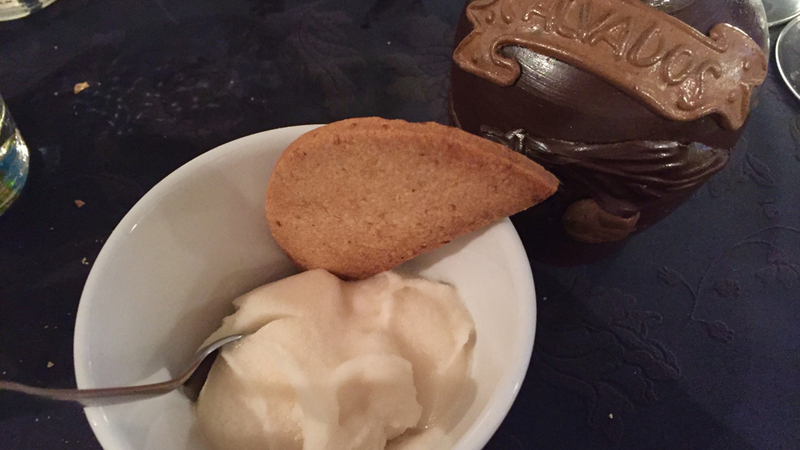 The farm cider sorbet was refreshing but deep, with above average concentration and length, and really cleansed the palate well. The wine list at La Petite Auberge is neither long nor replete with hard to find bottles, so it could use some fine-tuning. There’s nothing wrong with it, but I just can’t help but think that the very fine food here would be better served by a greater wealth of choices. The list does offer however some very carefully chosen wines and though not long, it offers something for everybody, from cider to the great Loire wines of Baudry. I personally love Chablis, and often will have one to start off my meal instead of a bubbly. Domaine Hamelin is a little known Chablis producer located in Lignorelles that began life under the stewardship of founder Gustave (in 1840) in Beines, another hamlet close to Auxerre and Chablis. The estate makes Chablis from two Premier Crus (Beauroy and Vaulignot), but I find their classic Chablis to be extremely good value for money and so am always happy to find it on restaurant wine lists. The 2014 Domaine Hamelin Chablis is a textbook Chablis, easygoing and ready to drink, full of citrussy charm; it’s not exactly the last word in complexity or concentration, but makes for a wonderful aperitif. Four generations and counting at the Maurice Lapalus estate in the Pierreclos village at the heart of the Mâcon wine district have been fashioning simple, easy to drink whites and reds with plenty of early appeal that are always relatively good buys especially when compared to much more expensive offerings on wine lists. 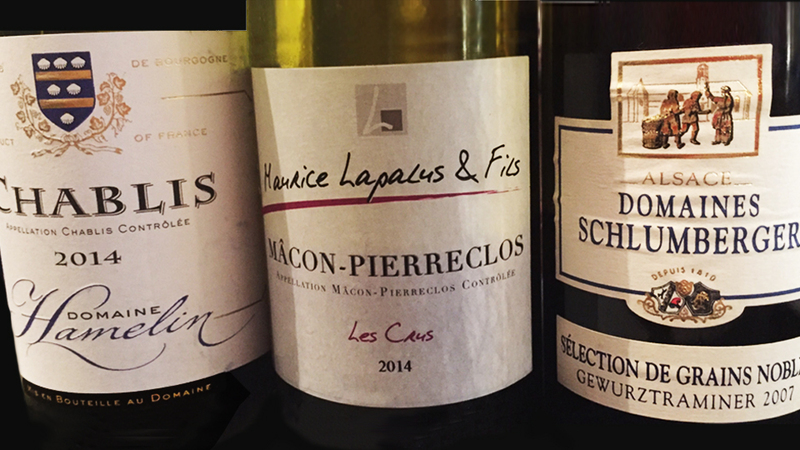 The 2014 Maurice Lapalus et Fils Mâcon-Pierreclos Les Crus, made from roughly 35 year-old Gamay vines planted on granitic-sandy soils, is more floral than fruity, crisp but well-balanced, though perhaps a touch diluted in the middle. Though it proves a fine pairing with the beef, I think this specific wine’s real calling is pairing with white meats such as turkey, chicken and rabbit as it lacks the flesh to stand up to a thicker, richer, textured slab of beef. My final wine of the night is the 2007 Domaine Schlumberger Gewürztraminer Séléction de Grains Nobles that, though rich and unctuous, expresses a gentler style of SGN. The honeyed tropical fruit and sweet spice aromas and flavors are nicely persistent and keep me company on my short walk along the beach back to my hotel.